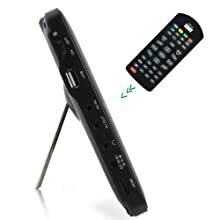 Freeview TV for UK and HD TNT / DVB TV for other countries, Plus all digital radio stations. Real-time and scheduled TV recording, 7 day EPG (Electronic Program Guide) and subtitles. 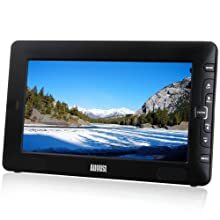 Plays video, music and digital pictures via USB port; Supports MP3, WAV, JPEG, MPEG4, AVI formats. Output TV/video/photos to large screens via HDMI port; AV-In port enables use as a high quality monitor. The DTV905 from August is a stylish, slim-line, high quality, portable Freeview TV. Ideal for taking on holiday or keeping the kids entertained on a long car journey, it is also perfectly sized for a bedside table or kitchen cabinet. The DTV905 makes a great addition to a caravans, camping and trucks. 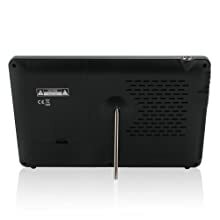 Utilising state of the art technology, the DTV905 portable TV includes features usually only seen on high-spec PVRs or Freeview boxes such as the ability to set up scheduled recordings and enable subtitles when available. 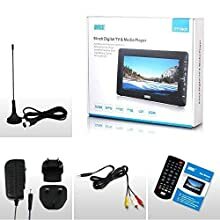 As the DTV905 has both AV-in and out, you can use it to watch your recorded shows or digital files on your living room set (just by attaching the cable).